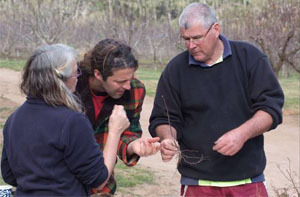 The Heritage Fruit Tree Register was launched on Friday 19th March 2010. 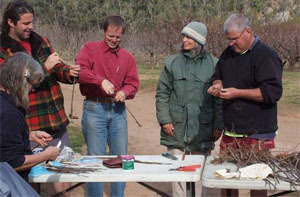 The Bega Valley Seed Savers are joining forces with SCPA South East Producers to create a register of heritage fruit varieties in the area. Our region has a long history of productive gardens so there are many old fruit varieties growing in gardens and on farms that can no longer be purchased from nurseries. The Seed Savers group would like to help save these old varieties by creating a register of trees that can be used for grafting material. 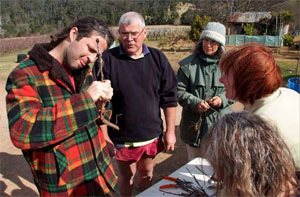 People with trees that they are willing to allow cuttings for grafting to be taken during winter are encouraged to add their tree to the register. Old productive trees of unnamed varieties - perhaps chance seedlings - are also of interest as they are proven performers in our climate and soils. These trees may in the future form the basis for new varieties. As well as people with old trees, people interested in propagating the heritage varieties are also being sought. More information is available from the Bega Valley Seed Savers - email seeds@scpa.org.au or call Liz on 6492 0923 or Anneke on 6492 0992.